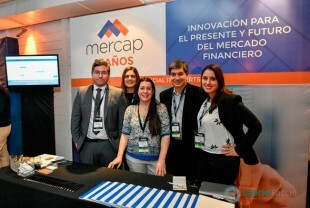 On the 27th and 28th of June, the AMBA (Argentine Bank Marketing Association) organized the 16th International Conference on Financial Business Technology, known on social networks as #TecnoAMBA. It was held at the Puerto Madero Yacht Club, where conferences and talks were given during two days about the new technological breakthroughs and current requirements in the bank market. Mercap was present as a sponsor with a very busy stand, together with other first-rate contractors like Banelco, Technisys, Red Link, Axxon Consulting, Xerox and Accusys (a partner of Mercap) and many others. Among the most interesting presentations, one of the highlights was the very popular “CIO Panel”, where the Technological Managers of some of the major banks (like Ciudad, Galicia and ICBC) shared the concerns that they have and improvements that they have carried out in their respective areas. At the end of event, Mercap raffled a dinner in Puerto Madero and a champagne that two guests won. As always, we thank the AMBA for another successful event.